The district cut the ribbon on the new field Friday, August 24th, just before the Blazing Trojans opening football game. Assisting in cutting the ribbon were the Bloom 206 Board of Trustees, Chicago Heights Mayor David Gonzalez, State Rep. Anthony DeLuca, South Chicago Heights Mayor Terry Matthews, Prairie State College President Terri L. Winfree, City Clerk Lori Wilcox and a number of other Chicago Heights officials, community members, students, and parents. The project was possible due to the partnership between District 206 and Chicago Heights Mayor David A. Gonzalez’s administration, successfully obtaining a grant under the QSCB Program for renovations at the Bloom and Bloom Trail campuses. 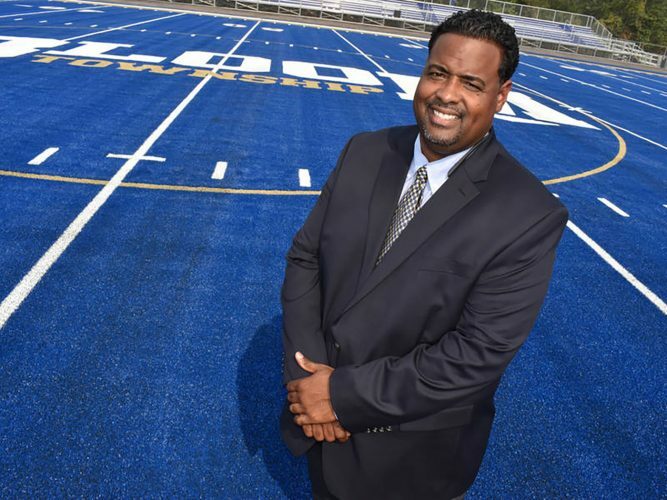 The football field sports new blue turf, bringing Bloom school spirit and a fresh look. The turf retains the same sport performance and safety as natural grass while eliminating the use of potentially harmful pesticides and fertilizers while significantly decreasing maintenance cost. Turf also allows for more frequent field use without the needed rest time natural grass requires. In addition, the revitalization included a resurfacing of the track and reconstruction of the track event areas such as the high jump, long jump, triple jump, shot put and discus areas. The natural grass has been transplanted into the Bloom courtyard and the district maintained all monuments and structures donated by and dedicated to alumni classes.